There were two live presentations of the new press at HdM. 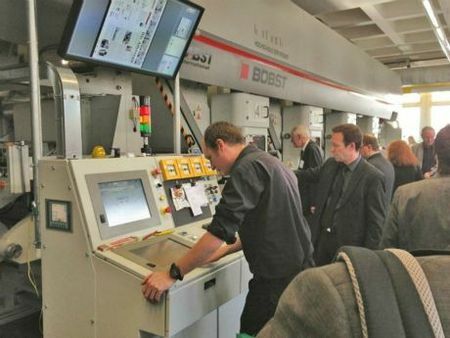 The gravure department of the Hochschule der Medien in Stuttgart/D celebrated the grand opening of the new rotogravure printing machine Rotomec MW60 beginning of March. The state-of-the-art printing machine is the university's first one and completes its full rotogravure production line in Stuttgart. "As a close cooperation partner of different education and research institutes including the Hochschule der Medien, it is a matter of course for Janoschka to support the project with rotogravure cylinders. We place a high degree of value on a continual exchange with other players in our sector," says Alexander Janoschka, executive shareholder.